SAN LEANDRO, Calif. — iHEAR Medical is giving consumers control of their own hearing health with the first ever Food and Drug Administration-cleared home-hearing assessment kit, called the iHearTest, a clinical paradigm shift in effective, affordable and accessible hearing screening technology. 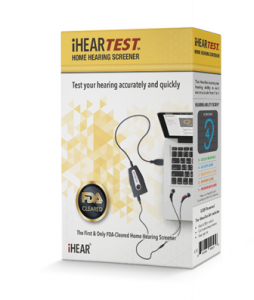 With a growing demand for self-monitored healthcare diagnostics, the iHearTest brings the first FDA-cleared hearing assessment kit into homes starting July 2018. Select CVS Pharmacy locations nationwide will be stocking their shelves with iHearTest so consumers can bring the kit home, take the 5 to 6 minute assessment and learn what their Hearing Number is on a scale from 1 to 5 (from profound hearing loss to good hearing in each ear). Hearing loss is the third most common physical condition behind arthritis and heart disease, affecting people of all ages, reports the Hearing Loss Association of America. Most often, hearing loss is gradual. Usually, it takes the intervention of a spouse or loved one to convince people with hearing loss to get their hearing evaluated. iHEAR Medical home-hearing screening kits will give consumers easy and instant access to check their own hearing from the comfort of their home. “Our vision was to develop technology that empowers and informs consumers about their wellbeing, as it relates to their hearing health,” said John Luna, chief executive officer of iHEAR Medical, Inc. “The future of screening diagnostics is being driven by consumers who want to take many routine assessments in the privacy of their homes. It’s now recommended that adults over the age of 40 years old screen their hearing annually. With the iHearTest we’re making it easy and accessible for people to incorporate this into their wellness routine.